Basically, video compression is divided into two categories: lossless compression and lossy compression. Lossless video compression is achieved mainly via video trim/crop to remove unwanted video clips from video to reduce video size. Lossy video compression makes video file smaller mainly through video codec conversion and parameters adjustment. Therefore, if you need a lossless video codec, sorry to tell you that there is no 100% lossless video codec. Don't be gloomy. There are visually lossless video codecs for you to shrink video file size with output quality almost equal to the original one. You can find out the best lossless video codecs (comparatively speaking) from the following video codecs comparison, which rounds up the currently most popular video codecs (incl. H264, MPEG-4, H265) for your reference. Background knowledge does matter a lot in learning something new. The same applies to know the best lossless video codec. Prior to go directly to the best visually lossless video codecs, you'd better have a basic understanding about the current most popular video codecs and their advantages and disadvantages. Thus, it would be much easier for you to conclude the best virtually lossless video codecs. Certainly, you can skip this part and jump to the section you need if you know a thing or two about the top video codecs. If not, you're suggested to spend 2 mins here reading the brief introductions of best video codecs. H264: is one of the most commonly used video compression standard for video recording, compression and distribution. Since H264 is jointly developed by ITU-T Video Coding Experts Group (standard setter of H261, H262, H263) and ISO/IEC JTC1 Moving Picture Experts Group (standard setter of MPEG-1, MPEG-2, MPEG-4), H264 is also called MPEG-4 AVC or MPEG-4 Part 10. It's extended from H263, MPEG-4 Visual and extended to H265 (HEVC). Pros: 1. Unparalleled compatibility, accepted by almost any device, player and platform. 2. Keep good balance between file compression and quality, virtually lossless in quality. Cons: The H264 file size of 4K/8K Ultra HD is comparatively large in size. MPEG-4: also a compression standard of audio and video digital data, absorbs a lot from its predecessors MPEG-1, MPEG-2 and others. Different from H264, MPEG-4 is an evolving standard, disintegrated into several parts, including MPEG-4 Part 2, MPEG-4 Part 10, MPEG-4 Part 14, MPEG-4 Part 16, etc. Pros: 1. Supported by most devices and platforms. 2. Produce excellent output quality, visually lossless. Cons: The compression ability is still needed to get improved. H265 (HEVC): the abbreviation of High Efficiency Video Coding (aks. MPEG-H Part 2), is a compression algorithm, much more efficient than its predecessor H264. When it comes to compare H265 with H264, the biggest difference lies in coding tree units. The pattern CTU sizes in HEVC can be extended from 16×16 pixel to 64×64 while H264 only has the power to support the block-size up to 16x16. Basically, HEVC offers around double compression ratio compared with H264, which makes it a primary choice to shrink and encode video to 4K/8K Ultra HD video. Pros: 1. High compression ratio, 2 times that of H264. 2. High effeciency without the expense of quality. Highest possible quality is guaranteed. Cons: Higher demands on hardware configurations. The video codec compatibility leaves something to be desired. the short form of Windows Media Video, WMV is a series of video codecs developed by Microsoft, with a purpose to replace QuickTime related tech standards and WAV/AVI file extension names. 1. ASF container format to contain the encoded multimedia content. 2. High data compression ratio, suitable for online video streaming. developed by Google, has something similar to H264, also a block-based transform coding format. It's usually contained by MKV or WebM container format with Vorbis and Opus audio. 1. Royalty-free public license, no patent fees. 2. Keep an even development between video file size and video quality. 1. Slightly lower quality than H264, visually no difference. a video codec library with ability to abridge length file to smaller size while maintaining highest possible quality. As the successor to DivX, XviD is now in active with MPEG-4 ASP standard to encode video with .AVI file extension name. a video codec standard widely used in digital television broadcasting and DVD video. 1. Large in file size. 2. Less compatible with mobile devices. the predecessor of MPEG-2, used mainly in VCD. After reading the above explainations of the most commonly used video codecs, you may have an overall understanding about the 8 video codecs. Yet, it's still hard to distinguish the delicate difference among some similar video codecs in respect of quality video compression ratio and file size. To make this clear, here we conduct a real test on these video codecs and use the actual test data to help you tell the specific differences among them. Which Video Codec is Virtually Lossless in Video Compression? From the above table, you can reach the conclusion that generally H264 is the best virtually lossless video codec with a good balance among quality, compression ratio and file size. More importantly, the video encoding speed is much faster than other codecs and also has better compatibility than others. If compression effiency is what you concern most, HEVC (H265) is your best video codec with virtually lossless quality and 65.36% file size off. The only downside is that HEVC is currently high demanding on your hardware configurations for HEVC playback. So make decision after you read the side-by-side comparison between H265 and H264 if you have no idea which to choose. If the video converter software you're using doesn't support H264 or HEVC video codecs, take the all-in-one MacX Video Converter Pro into consideration. This is an all-round video processing tool capable of helping you convert any video to H264, HEVC, VP8, VP9, MPEG-4, MPEG-2, MP4, MOV, MKV, FLV, AVI, etc. 180+ video and 14+ audio formats thanks to 370+ video codecs supports. What's plus, you can also shrink and reduce 4K MP4, MKV, AVCHD, etc. video file size via codec conversion, video editing (trim/crop) and parameter adjustment (lower 4K to 1080p, tweak frame rate/bit rate...) at 10% - 80% compression ratio. Output video quality can be maximumly reserved to 98% - 100% (High Quality Engine) if you only choose editing or two of three compression methods. Step 1: Free download and run this video codec converter. If your computer supports AMD APP or Nvidia (NVENC/CUDA), the "Hardware Encoder" option will be automatically ticked at the lower right side of the main interface. Step 2: Tap "Video" button to import videos. Drag-and-drop is also supported. Step 3: Choose the output video format with best virtually lossless video codecs H264 or HEVC based on your specific needs. Step 4: Tap "RUN" button to begin transcoding video to best lossless video codec at GPU hardware accelerated speed. You can see the detailed conversion average frame rate shown on the conversion window. 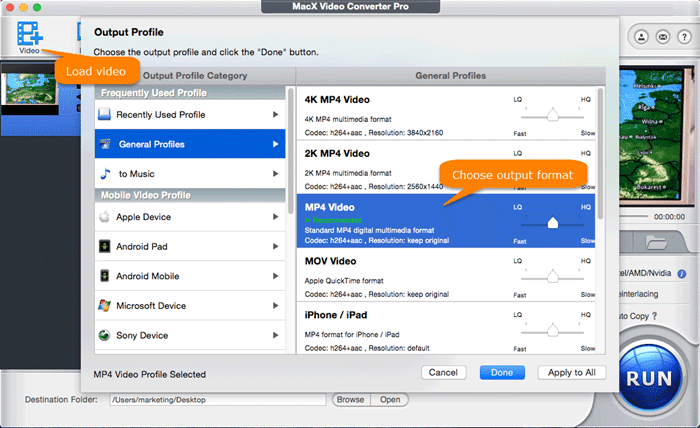 MacX Video Converter Pro, an all-around 4K video processing tool, can convert and shrink 4K, MP4, MKV, MOV, etc. any video to virtually lossless video codec at 5-8X faster speed thanks to the powerful Intel/AMD/Nvidia hardware acceleration techs. Full guide to show you how to reduce video size in 3 ways. Try best video shrinker to reduce video (4K) to smaller size. No budget plan for paid video shrinker? Try this free one. Find the best from the online compressor candidates.